The importance of a social media cover photo can be described when someone understands the importance of cover letter with a resume; time is money here, say quickly and say all. Your cover snap presents a great detail about you, your brand, and anything, within a pinch. These cover photos put a great and accurate impact upon the visitor’s mind regarding your product or mindset. However, designing social media cover photos have gone pretty tricky these days, especially for those who use it in a professional way. In fact, needless here is to mention about the habit of social media platforms to revamp their layout patterns that certainly involves something with works like cropping, resizing, etc. And, each time you can't spend huge money with designers for the purpose. 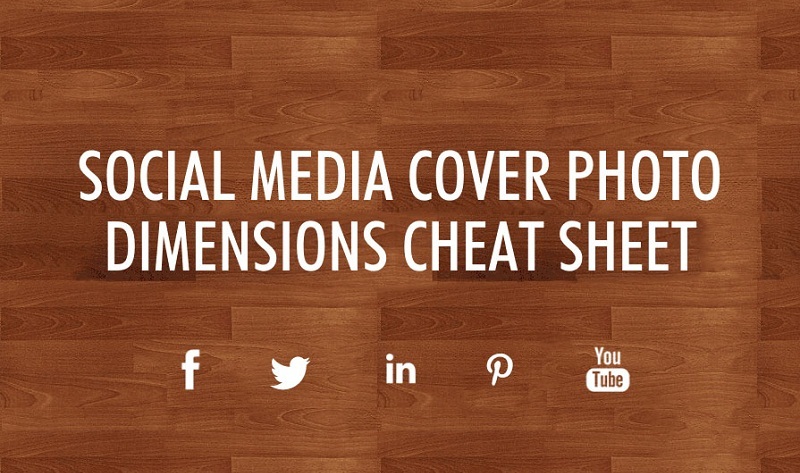 Hence, the best way is to go through the cheat sheet for social media cover photo dimensions. The infographic below, created by Covershub, presents a nice cover photo cheat sheet that holds most upgraded cover picture dimension for major social platforms - Facebook, Twitter, LinkedIn, YouTube and Google+ - that can be really useful for you on this regard. Facebook has revamped the whole look as its cover picture should be 851 pixels wide and 315 pixels tall. Talking of the profile picture, it has to be of 160 x 160 pixels minimum and 180 x 180 pixels gives the best result. Your twitter cover picture needs to be of 1500 pixels wide and 500 pixels tall, the minimum statistics for profile picture here should be 200 x 200 pixels. 3:1 and 1:1 make the perfect ratio for header image and profile picture. The best result for your LinkedIn cover photo is 646 x 220 pixels. The maximum size you can upload is 2MB. Standard logo size must be 100 x 60 pixels. Square logo size should be 50 x 50 pixels, LinkedIn has different dimensions for cover photos on Company Career page and Premium user profile page but we summed up all the things in an infographic. The 1080 pixels wide and 608 pixels tall profile picture gives the best output for GooglePlus. Your cover picture here should be of minimum 480 x 270 pixels resolution. Your cover picture gives the best output being 2560px wide x 1440px tall for this video sharing platform. However, with slates the count becomes 1855x423 pixels, and 1546 x 423 for tablets and smartphones.